Acid Attack Survivor Shows How Easily Available Acid Is, Through A Make-Up Tutorial. Make Love, Not Scars, a youth initiative that focuses on the upliftment and rehabilitation of survivors of gender violence, uploaded a video that shows a woman explaining how to get perfect red lips. The woman in the video, Reshma, is an acid attack survivor who goes through the process of acquiring the perfect red lips, step-by-step. But at the end of the video, she explains the reason behind her makeup tutorial. 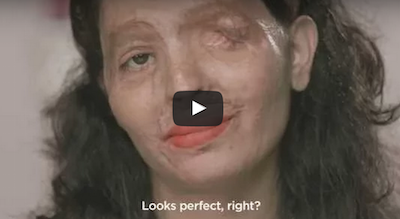 It shows the shocking reality of what can happen to someone who is attacked by acid. It happens more than you think it does!